With only three minutes to discuss your school counseling program, what would you say? Explore the ways the ASCA National Model demonstrates how a comprehensive school program is critical and how school counseling program goals and outcomes support the school’s mission. Learn to establish the focus of your comprehensive school counseling program based on students’ academic, career and social/emotional needs. Discover how your beliefs, vision statement, mission statement and program goals contribute to your program’s focus. 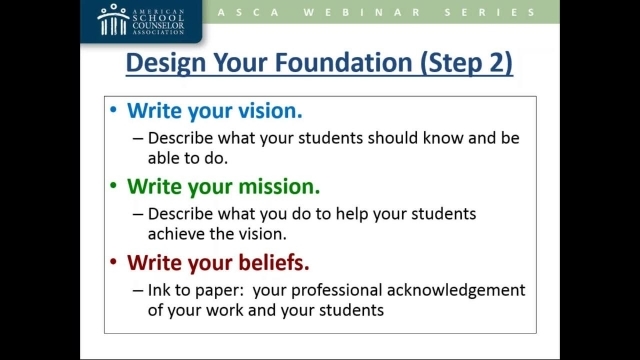 Hear how student competencies, professional competencies and ethical standards should be at the foundation of your school counseling program. Deirdra Williams is the dean of counseling and student services at Heritage High School in Wake Forest, N.C. She is a lead RAMP reviewer and provides professional development on various aspects of using the ASCA National Model.